KERN offers a professional transcription service to create written records of German or foreign language audio or visual material. Transcription is the transfer of spoken texts and conversational situations from audio and video recordings including audio cassettes, audio CDs, DVDs and MP3 files or other file formats such as Wav, into written form . The variety of texts which need to be recorded in writing ranges from video conferences, telephone interviews as a data collection strategy and in social research and interviews for films and television productions to lecture series. Experience has shown that an hour of audio material results in approximately 30 to 40 standard pages of typed text. The time required for transcribing audio material can be measured by a factor of five to nine, depending on the quality of the recording, the speed of the speech, and the degree of accuracy required for the transcription to be adapted for its purpose. The relatively high level of time and effort required for a transcription is due to dialects of the speakers and background noises, which make it necessary to repeatedly play back the recording. A transcription of the audio material that contains neither gaps nor errors, and in which even the smallest details of the utterances are recorded, including when speakers' utterances overlap requires the highest level of concentration. 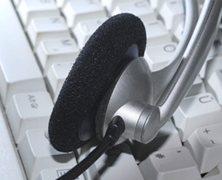 Appropriate transcription guidelines must be taken into consideration, depending on the purpose of the transcription. Unless the client requests otherwise, the material will be transcribed in words and in detail, i.e. not phonetically or in a shortened form. Dialectal features and sounds such as er, um, and so on are generally not transcribed. Language and punctuation are adapted to written language. Long pauses are marked by ellipses and passages of texts that were particularly emphasised are underlined; interjections from other people, laughter, or sighs are noted in brackets. Changes in speakers are indicated by new lines and, if applicable, an anonymous designation (Speaker 1, Speaker 2). Other features of an interview situation, such as entering or leaving a room or a telephone ringing may also be of interest and can be noted upon request. After the text has been recorded in writing, a spell check must be carried out, and the text is formatted according to the client's specifications if this is requested. After the completion of the transcription, there is also the option of having the text translated. What format is the audio material in (MP3 files, cassettes, etc.)? How many minutes/hours of audio material are there? What type of audio material is it? What is the purpose of the transcription? Do you have any particular formatting requests or transcription rules? What file format is required for the transcribed text? Do you require a translation after the transcription?